We proudly maintain the highest safety procedures, regulations and licensing. When making a decision between private and commercial air travel, the safety reputation of an air charter is of utmost importance. Fortunately, there are strict regulations that private air charters must adhere to in order to transport paying passengers. At Private Jets, these regulation requirements are met and surpassed, providing customers with peace of mind as they travel the skies. Private air charter is classified as basic aviation. Because of this, in order to serve as transport for paying customers, a private air charter must be certified by the Federal Aviation Administration under FAR Part 135. Private Jets employs only aircraft and operators that are classified as being in compliance with FAA regulation under FAR Part 135. The FAR Part 135 certification was designed to set an industry standard by which all aircraft safety, repairs and maintenance, regulations and licensing, and general operating, are measured. 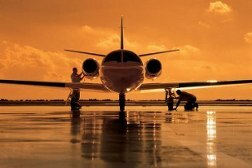 Private Jets is proud to maintain the highest safety procedures, regulations and licensing. Passenger safety is their first priority. For instance, Private Jets only books flights that incorporate two pilots. Taking that measure doubles the alertness and safety of piloting a private jet. Private air safety factors are assured by the Federal guidelines Part 135 of the Federal Aviation Administration aircraft certification system and are established expressly for standards jets that have 9 seats or fewer. A private aircraft, including its crew, is thoroughly evaluated by federal inspectors and must meet their strict criteria. This list of evaluated criteria incorporates: pilot and crew certifications and proof of experience, emergency procedures and training, flight control, record keeping, routine maintenance, facilities, and aircraft components. The aircraft Prive Jet books proudly exceed the requirements set forth by Part 135. Prive Jet encourages passengers to speak directly to pilots and crew regarding credentials and safety records. Having their passengers feel completely confident in their safety is Private Jets’ primary concern. Every one of the private aircraft Prive Jet employs is rated ARG/US and/or Wyvern-compliant, reaching the industry's maximum standards. The Wyvern Customer Advisory Board set the Wyvern Standard. The Wyvern Standard vastly surpasses the minimum government standards for certified aircraft hire. In fact, in a study taken over a 17-year period, not one Wyvern recommended aircraft or aircrew was involved in a fatality. When taking into consideration other general aircraft safety concerns, such as size and easy of maneuverability, one can understand why the sensible course of action is to book a private jet instead of a commercial airplane. One example of the benefit to flying with a smaller craft is that they have the ability to fly to heights of 40,000 feet, which puts the aircraft above turbulence. When flying at 40,000 feet, other aircraft is below and out of the way. If stormy weather hits, a private air charter has the ability to land in a small airport, if needed, or even land in unconventional spaces such as freeways. There are many reasons to choose private air charter over commercial air travel. Private Jets is a leader in safety, service and experience. They are proud to provide only the very best for their customers.